Tartaric acid is a crystalline organic acid that exists in four isomeric forms and occurs widely in plants. It occurs naturally in many plants, particularly grapes and tamarinds, and is one of the main acids found in wine. It is added to other foods to give a sour taste, and is used as an antioxidant. 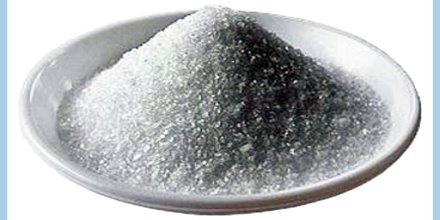 Salts of tartaric acid are known as tartrates. Its chemical formula is C4H6O6. 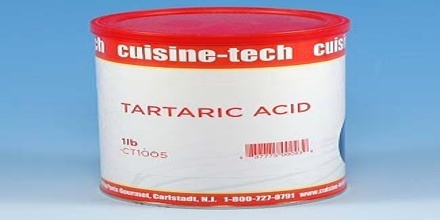 Tartaric is an alpha-hydroxy-carboxylic acid, is diprotic and aldaric in acid characteristics, and is a dihydroxyl derivative of succinic acid. It is found in byproducts of wine fermentation and has a wide variety of uses, including making cream of tartar and baking powder, to add effervescence to beverages, to polish metal, in printing and dyeing, and to make photographic chemicals. In a partially purified form, tartar was known to the ancient Greeks and Romans; the free acid was first isolated in 1769 by Swedish chemist Carl Wilhelm Scheele. The lees, or sediments, and other waste products from fermentation are heated and neutralized with calcium hydroxide; the precipitated calcium tartrate is then treated with sulfuric acid to produce free tartaric acid. 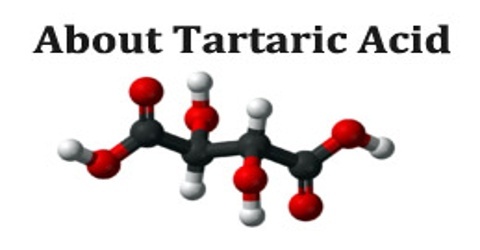 Tartaric is basically an alpha-hydroxy-carbolic acid. The acid characteristics of this organic substance is aldaric and diprotic. At the same time, tartaric is also a dihydroxyl offshoot of succinic acid. Tartaric acid is a diprotic acid; it denotes that each molecule of the compound comprises two hydrogen atoms, which can be ionized in water. The salts of tartaric acid are known as tartrates. Tartaric acid is a naturally occurring organic compound. However, these days this acid can also be produced synthetically. Basically, tartaric acid has two different forms – mesotartaric acid and levotartaric acid. Both these forms of tartaric acid can be produced artificially. Louis Pasteur was the first to create the pure form of levotartaric acid in 1847. Naturally-occurring tartaric acid is chiral, meaning that it has molecules that are non-superimposable on their mirror-images. It is a useful raw material in organic chemistry for the synthesis of other chiral molecules. The naturally occurring form of the acid is L-(+)-tartaric acid or dextrotartaric acid. The mirror-image (enantiomeric) form, levotartaric acid or D-(-)-tartaric acid, and the achiral form, mesotartaric acid, can be made artificially. Three stereoisomeric forms of tartaric acid exist: (1) dextrorotatory tartaric acid (d-tartaric acid) found in grapes and several other fruits, (2) levorotatory tartaric acid (l-tartaric acid) obtained chiefly by resolution of racemic tartaric acid, and (3) a meso or achiral form. Racemic tartaric acid (an equal mixture of d- and l-tartaric acid) is prepared commercially by the molybdenum- or tungsten-catalyzed oxidation of maleic anhydride with hydrogen peroxide. Tartaric acid is found in cream of tartar, which is used in making candies and frostings for cakes. 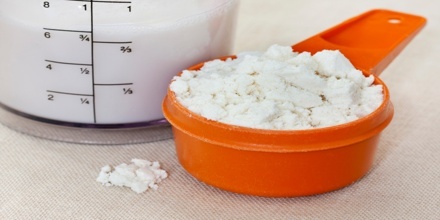 Tartaric acid is also used in baking powder where it serves as the source of acid that reacts with sodium bicarbonate (baking soda). This reaction produces carbon dioxide gas and lets products “rise,” but it does so without the “yeast” taste that can result from using active yeast cultures as a source of the carbon dioxide gas. It is also used in silvering mirrors, tanning leather, and in the making of Rochelle Salt, which is sometimes used as a laxative. Blue prints are made with ferric tartarte as the source of the blue ink. Tartaric acid as well as its several derivatives has numerous applications in the pharmaceutical field. Potassium antimonyl, which is derived from tartaric acid, is called tartar emetic and it is included in very little doses in cough syrups in the form of an expectorant. Tartaric acid also has several uses other than the human body. For instance, this acid is employed in preparing cement wherein it is said to slow the pace of cement from setting, thereby allowing for a larger window for people to work. As in the case with the construction industry, tartaric acid is also used by the cosmetic industry. In the cosmetic industry, this acid is used in the form of base for several dissimilar types of products meant for topical application such as body creams and various other lotions. Reference: britannica.com, dictionary.com, herbs2000.com, thechemco.com, wikipedia.